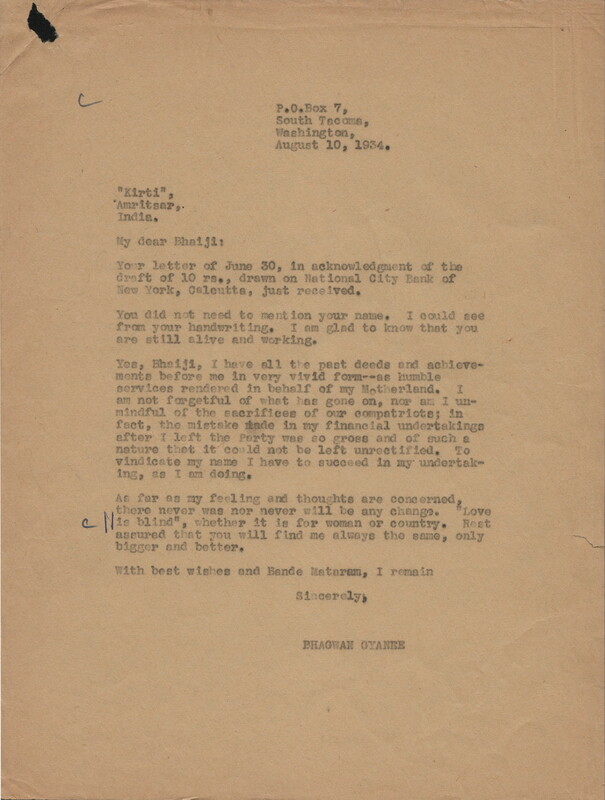 Letter from Bhagwan Singh to "Kirti"
Letter from Bhagwan Singh Gyanee to "Kirti" in Amritsar, dated August 10, 1934. The letter suggests that the addressee was under some surveillance. Gyanee writes, "You did not need to mention your name. I could see from your handwriting. I am glad to know that you are still alive and working." 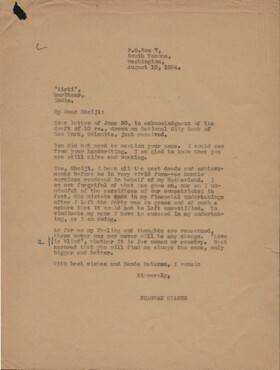 Your letter of June 30, in acknowledgment of the draft of 10 rs., drawn on National City Bank of New York, Calcutta, just received. You did not need to mention your name. I could see from your handwriting. I am glad to know that you are still alive and working. Yes, Bhaiji, I have all the past deeds and achievements before me in very vivid form--as humble services rendered in behalf of my Motherland. I am not forgetful of what has gone on, nor am I unmindful of the sacrifices of our compatriots; in fact, the mistake made in my financial undertakings after I left the Party was so gross and of such a nature that it could not be left unrectified. To vindicate my name I have to succeed in my undertaking, as I am doing. As far as my feeling and thoughts are concerned, there never was nor never will be any change. “Love is blind”, whether it is for woman or country. Rest assured that you will find me always the same, only bigger and better.